Thanks to two recent articles in the Pittsburgh (PA) Tribune-Review and Pittsburgh (PA) Post-Gazette, I am reminded of the alternatives to backyard amenities such as a pool/spa, BBQ/outdoor kitchen, fireplace/fire pit, etc. Even though these elements can be big hits with the little ones (you know you wish you had a dime for every time they’ve asked you to dig a pool), they require adult supervision at the least, can be much too expensive or impractical to implement and maintain on a regular basis, or require more space than is available in your kingdom. For those with kids, you know that the simplest of things can sometimes offer hours of entertainment. Aren’t convinced yet? Do you remember a few birthdays ago when your child paid more attention to the packaging and wrapping paper than the $100+ toy that came inside, that you went to four different malls to find? With a little creativity and not a lot of money, you can provide an endless array of attention getting (& keeping) ideas to not only keep them busy, but also encourage them to learn about their surroundings. Below are some low-cost, highly interactive strategies to get your kids outside learning about their natural environment, and away from the television and video games they so desperately rely on. Sandbox: A sandbox is simple to build or inexpensive to buy compared to the enjoyment and imagination it will provide. It’s not quite the beach, but with a little water and some buckets, the castles can be just as grand. Keep in mind that they aren’t the neatest things in the world, so be sure to locate the structure far enough from the door that sand will be knocked off of shoes by walking through grass or on sidewalks instead of being tracked inside, but not too far out of the sight of the adult in charge. Sandboxes are also low impact and leave little trace when removed, as the sand can be mixed into any planting bed or garden plot and may actually help by improving drainage. Bird/Hummingbird Feeder: These little additions can be captivating through what they attract. But, they can also be works of art in their own right. A quick google search can offer numerous ideas in construction style, theme and material. Depending on the food of your choice, they can also differ in which species they attract. Through observing and charting the various types and their activities, habits and seasonal patterns, kids will develop an appreciation for their new winged friends. Anytime play can be mixed with education, consider it a win-win and time well spent. 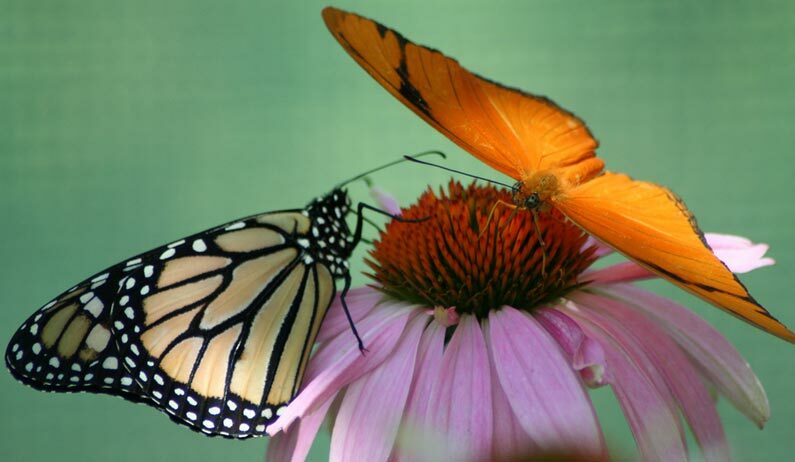 Butterfly Garden: Through a little research (thanks again, Google!! ), one can arrive at a long list of plants that attract these lovely looping and diving floaters. (psssst… by the way, these plants will usually attract additional birds and hummingbirds as well.) Since these plants are mostly summer bloomers, it’s a good idea to include plants that bloom during other seasons within to maintain good color balance throughout the year. But this addition doesn’t have to occupy very much space. In fact, a butterfly garden can be implemented in even the smallest of spaces, such as an apartments’ balcony. Tree Swing: This one is simple. Find an old tire and rope (not TOO old, though!) and find a tree large enough to support even your weight (in case you want to join in on the fun at some point). Make sure the tire is washed thoroughly, preferably at a high pressure car wash, then hand-scrubbed with a bleach-based solvent. You don’t want your kids smelling like an old Michelin at the dinner table, do ya? Tie everything together and sling the rope over the biggest branch you can find (more official-sounding instructions here). Before you know it, this will provide hours of parent-child bonding, solitary contemplation and countless action photo opportunities. It may also be where your budding pitcher works on his or her fastball when playmates are scarce. They can be hung horizontally too, but this requires a few more materials to complete. If you or your dad was an engineer, and you have to do everything to the extreme, go here. Or, if you’re looking for some more creative ideas, this site has some great looking variations of the old standard. If you don’t have a large tree in your yard, and don’t want to wait thirty years for that sapling to grow big enough, a mount can be constructed from a few pressure-treated 6×6 timbers, or from retrofitting an old swing set. By adding wood chips or mulch about the swinging radius, you soften the landing, reduce the chance of mud after inclement weather and eliminate a few square feet of mowing time from you precious weekend days. We’re all looking for a few ways to save some dough this summer. I understand; I’m with ya. But that doesn’t mean you have to sacrifice your child’s growth (or your sanity). It’s much too nice outside to allow them to veg in front of that TV or video game all day. Believe me, they will thank you for it soon, if they haven’t already. So, what are you waiting for? Go outside and get dirty!! PS- All of those underlined words above are for you to click on to further explore that specific topic, if you choose. Enjoy! Share the post "Backyard adventures"